After a day of wind rain & hail (yes, hail!) I could think of nothing better then a big plate of spaghetti bolognese for dinner tonight. But. lasagna would be really yummy too wouldn’t it?? 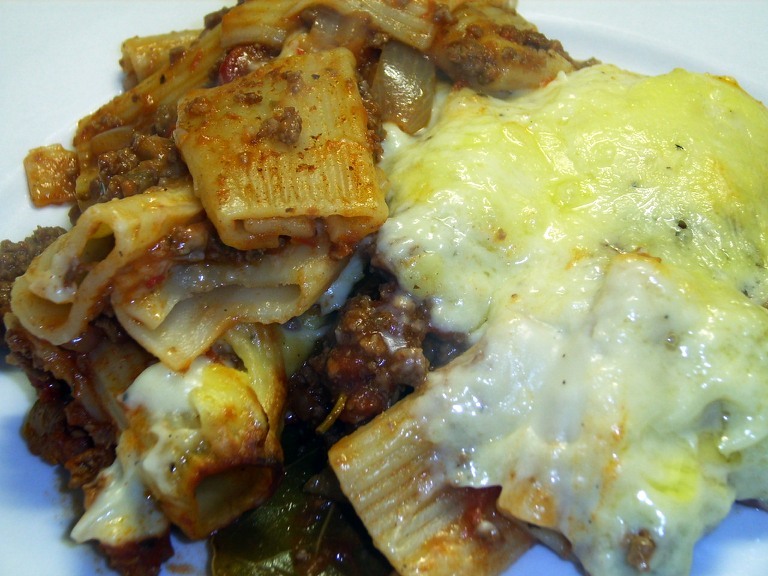 But I just couldn’t be bothered with all the layers etc… So I settled for something in between a lasagna & a bolognese. I call it my lazy lasagna!! You can make up the bolognese sauce in advance and freeze it. The amount of sauce in this recipe is too much, but you can always freeze it for another day (in fact the more you make the better, it’s like a staple food around my house. Freeze it in portions that are easy to use). In a large saucepan, heat up a good amount of olive oil. Fry mince meat until cooked through, making sure to break up any chunks of mince. Boil off meat juices, and then add onion & cook until soft. Add rest of ingredients except for the garlic, and simmer on low heat for about an hour, stirring occasionally. Add the garlic in the last ten minutes, and take a taste test, add anything else you think the sauce needs. Let cool in the pot for a few minutes, before tranferring it to your containers for fridge and/or freezer. Put a large pot of water on to boil; you will need to select a pasta type with large holes or spaces with which to catch the sauce with., such as Conchiglie (large shells), Fusilli (large spirals) or Rigatoni which is what I used tonight. While pasta is cooking, you will need to make a batch of white sauce, which I’ve already detailed here. Drain pasta once it’s al dente, and return it to the now-empty pot, and stir in a good amount of your bolognese sauce to coat all the pasta (the sauce will need to be warmish to do this; if you try to do it with sauce straight out of the fridge you’ll rip your pasta apart trying to stir the sauce through). Pour pasta mix into a baking dish, leaving some space for the white sauce. Spread pasta out evenly & then gently pour the white sauce onto the pasta so it forms an even layer over the pasta mix. Top with grated cheese if desired, and bake for 30-40 minutes until golden brown. Serve & warm yourself on a cold Wintery night! This entry was posted on October 21, 2008 at 8:01 pm and is filed under Evening Meal. You can follow any responses to this entry through the RSS 2.0 feed. You can leave a response, or trackback from your own site. Hi…the receipe is interesting…can u write abt some more pasta thoughts….Do drop in my blog….if u r interested in Indian cooking..believe me it has lot of varity too.